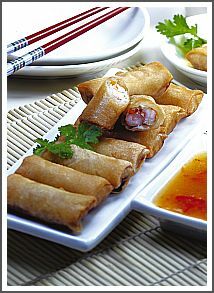 Lumpia, one of the most famous Asian desserts. Even out Asia this is very best known and favorite of the most people. In West Europe especially in Netherlands, people are crazy about this dessert. There is a lot of variation that you can make. You can use chicken or shrimp or even without meat. But one thing for sure is that in this snack is bamboo shoot always present. Bamboo Shoots are the key of all kind Indonesian lumpia. You can’t leave it. It’s not also the taste that people like it, also the short time and easy way to make it make this spring roll so popular. And the nutrition value of this snack is very high. It contains low fat and a lot of vegetables, make this desserts recipe one of the low calorie vegetarian recipe and healthy. You can also use mung bean sprouts and tofu, but these would make it wet and this is another variation of this spring roll, we call it “lumpia basah” wet lumpia. You don’t have to bake it. You fill the sheets with the filling and you have to eat it directly, so fresh from the kitchen. It’s difficult to hold it for days, it would be wet and the taste wouldn’t be so good anymore. This is very suitable if you’re at home the whole day and you eat it up at the same day. The recipe here that I want to show you is the dry variation. You can stock them up in the freezer without getting lost of taste. It contains carrots and bamboo shoots that keep very good if you put it in the freezer, in contrast with mung bean sprouts and tofu that won’t keep good if you freeze them up. 1. Chopped chicken and pork filet into small pieces. Sprinkle some lemon juice over this. Set aside. 2. Heat the 2 tablespoon sun oil in the pan, add garlic, stir it until fragrant, add the chicken and pork filet. Stir it until all the meat get tender and well done. 3. Add carrot. Bamboo shoots, and spring onion, mix them well. 4. Add bouillon powder, oyster sauce, salt and sugar. Mix them until well. 5. Correct the seasoning if needed. •	Spread out a Lumpia Spring Rolls Sheets, put some filling in de middle of it, fold one side and follow the left side and the right side, the roll to the edge of spring roll, and make it tight with some white eggs, spread on the top. •	Bake the loempia in heat oil.